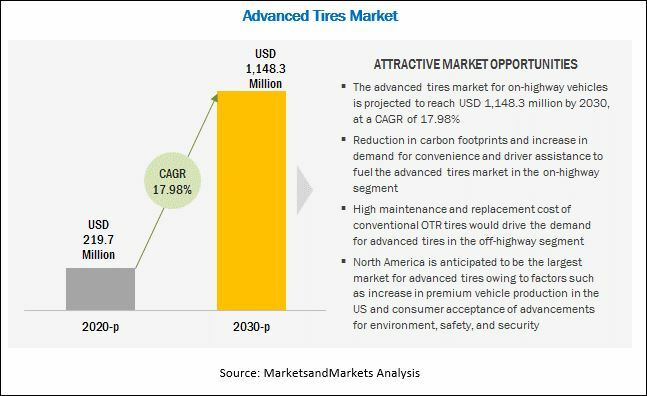 [160 Pages Report] The Advanced Tires Market is projected to grow at a CAGR of 17.98%, during the forecast period, to reach a market size of USD 1,148.3 million by 2030 from an estimated USD 219.7 million in 2020. Increasing premium cars production and developments in connected car technologies are estimated to increase the overall demand for advanced tires across the globe. Additionally, the increasing focus of tire manufacturer on the advanced technologies such as 3D printing, organic raw material and autonomous vehicle is expected to further boost the demand for advanced market in future. Increasing demand for autonomous and connected technologies in automotive is expected to drive the market for advanced tires. Advanced tires comprise technologies such as chip-embedded, self-inflating, multi-chamber, and all-in-one tires. These technologies are expected to increase the in-vehicle convenience by significantly. These technologies help increase the durability of the tire by real-time monitoring of tire pressure. Moreover, the tire pressure within normal range also improves the fuel efficiency of the vehicle. Hence, advanced tire technologies are expected to lower the maintenance cost of the vehicle resulting in an increasing demand for advanced tires across the globe. Furthermore, the ongoing new product developments by leading companies are likely to propel further growth of the advanced tires market for the longer forecast. The research methodology used in the report involves various secondary sources such as EAMA, OICA, CEMA, and paid databases such as Marklines, Factiva, and other directories. Experts from related industries and suppliers have been interviewed to understand the future trends of the advanced tires market. The bottom-up approach has been used to estimate the market size, by volume. The estimated installation rate of advanced technologies has been derived using primary and secondary at regional level. 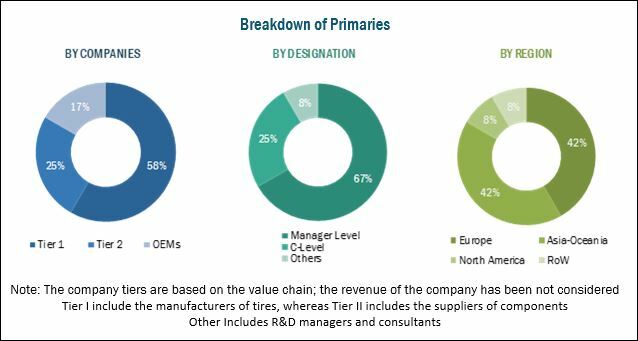 The market size, by volume, is multiplied by the estimated average OE price (AOP) of tires unit required for each application and vehicle segment to calculate the market size in terms of value. Summation of the country-wise markets gives the regional market, and further summation of the regional markets provides the global tires market. Dealers and distributors of tires and technology suppliers are consulted for information. The same approach has been used to derive the off-highway advanced tires market. The advanced tires market is dominated by a few globally established players such as Continental (Germany), Bridgestone (Japan), Michelin (France), Goodyear(US), Pirelli (Italy), Sumitomo (Japan), Yokohama (Japan), Hankook Tire (South Korea), Nokian (Finland),CEAT (India), and Toyo Tire (Japan). With the given market data, MarketsandMarkets offers customizations in accordance with the company’s specific needs. 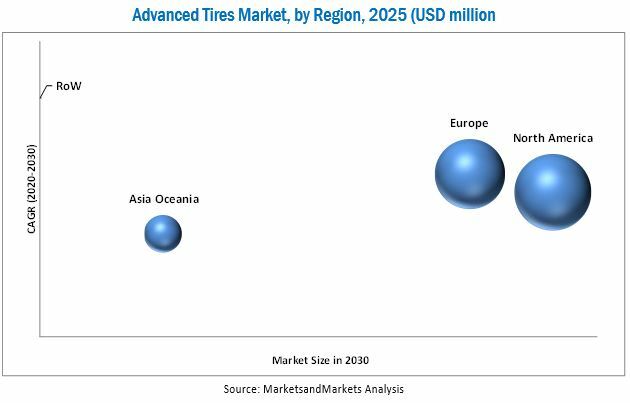 The advanced tires market is projected to grow at a CAGR of 17.98% during the forecast period, to reach USD 1,148.3 million by 2030 from an estimated USD 219.7 million in 2020. Increased focus toward reduction in carbon footprints by the tire manufacturing industry, high demand for green and organic raw materials for tires, and the rising need for safety and convenience are the key factors driving the growth of the global market. The pneumatic tires segment is projected to hold the largest market share from 2020 to 2030. Pneumatic tires are estimated to have a high installation rate in passenger cars as they deliver a better performance in terms of grip and movement of the vehicle. Additionally, pneumatic tires are easy to mass produce for all tire manufacturing companies with existing production capacity. Moreover, the high durability of pneumatic tires coupled with high load carrying capacity fuels the demand for advanced pneumatic tires. The LDV market is estimated to account for the largest market share. Increased production of premium vehicles in the regions such as North America, Europe, and some countries from Asia Oceania along with an increased demand for connected technologies has resulted in the growing demand for advanced tires. Additionally, the high-end SUVs are also driving the demand for the advanced market as premium cars, and high-end SUVs are estimated to be the early adopters of advanced tires. The self-inflating technology is estimated to show the fastest growth for on-highway vehicles during the forecast period. Increased production of commercial vehicle and demand for better tire performance in commercial vehicles are estimated to fuel the demand for self-inflating tires. The growing number of fleet management technologies in the developed regions such as North America and Europe are expected to drive the demand for self-inflating tires further as they enable the vehicle to maintain tire pressure within a range which increases the tire durability. Additionally, safety and convenience needs in passenger cars will propel the self-inflating tires market providing a high growth opportunity for tire companies. The elastomers are estimated to lead the advanced tires market by material. Need for lightweight and durable raw materials will fuel the demand for elastomers. Also, the price fluctuations and a decrease in the production of natural rubber are estimated to hamper the tire manufacturing companies. This has led to the demand for elastomers. The market in Europe is expected to grow at the highest CAGR for advanced tires, in terms of value, during the forecast period. Countries such as Germany, the UK, and France are the key markets for advanced tires. As per the German Trade & Invest (GTAI), Germany and the UK account for the 35% of total premium cars production worldwide. Furthermore, the adoption rate of connected technologies in automotive is high which is boosting the demand for advanced tires in Europe. The high capital costs of developing advances tires and mass production of advanced tires are the key restraints for the growth of the advanced tires market. Also, the acceptance of the customers towards the advanced tires may act as a problem due to the pricing and functional change in tires. Moreover, the real-life implementation of tires such as all-in-one, multi-chamber and Airless tires is estimated to hinder the growth of the market. The advanced tires market is dominated by a few globally established players such as Continental (Germany), Bridgestone (Japan), Michelin (France), Goodyear(US), Pirelli (Italy), Sumitomo (Japan), Yokohama (Japan), Hankook Tire (South Korea), Nokian (Finland),CEAT (India) and Toyo Tire (Japan). Major player such as Goodyear and Michelin are adopting strategies such as new product development to gain traction in growing segment of automated and 3D printed tires segments. Goodyear and Michelin have already launched advanced tires concept and to mass produce launched products these players have enough production capacity and long clientele of leading OEMs. These factors will play major role in gaining traction in advanced tires market. 15.11 Toyo Tire & Rubber Co. Ltd.
*Details on Business Overview, Products Offered, Recent Developments, & SWOT Analysis Might Not Be Captured in Case of Unlisted Companies.